Much of South Vietnam is covered with dense jungle vegetation, used as cover during the Vietnam War by the enemy opposing the United States and its allies. One means the U.S. military used to counteract this advantage was the indiscriminate use of herbicides to destroy enemy cover and food crops and to clear U.S. base perimeters. These chemicals were extensively sprayed by airplanes (Operation Ranch Hand), helicopters, trucks, riverboats, and individual backpacks. More than three and one-half million acres of South Vietnam were repeatedly sprayed with more than 50,000 tons of Agent Orange and about eighteen other herbicides containing more than 500 pounds of dioxin. The military used twenty-seven times more herbicide per acre than recommended for domestic applications. Long-term, low-level dioxin exposure is the focus of veterans’ health concerns because of its extreme toxicity. However, many potentially life-threatening chemicals also were used throughout Vietnam. There were a variety of means by which veterans were exposed to herbicides in Vietnam. Some veterans took part in the actual spraying. Others were exposed by consuming contaminated food or water. Veterans were in areas while spraying occurred, in areas that were recently sprayed, and in areas that were sprayed and then burned (Operation Arc Light). Burning increases the dioxin toxicity of the herbicides by 25 percent. Agent Orange had its genesis as a defoliant in an obscure laboratory at the University of Chicago during World War II. Working on experimental plant growth at the time, researchers discovered that they could regulate the growth of plants through the infusion of various hormones. Certain broadleaf vegetation, they discovered, could be killed by causing the plants to experience sudden, uncontrolled growth. They gave the plants a fatal, chemically induced life-cycle boost. In some instances, deterioration of the vegetation was noticed within 24-48 hours of the application. The Army experimented with 2,4-D during the 1950s. Late in that decade, researchers found a potent combination of chemicals that quickly found its way into the chemical arsenal. Army scientists found that by mixing 2,4-D and 2,4,5-trichlorophenoxyacetic acid (2,4,5-T) and spraying it on plants, there was a nearly immediate negative effect on the foliage. What they didn’t realize—or chose to ignore—was that 2,4,5-T contained dioxin, a useless byproduct. It would be twenty more years until concern was raised about dioxin, a chemical the Environmental Protection Agency would later label “one of the most perplexing and potentially dangerous” known. 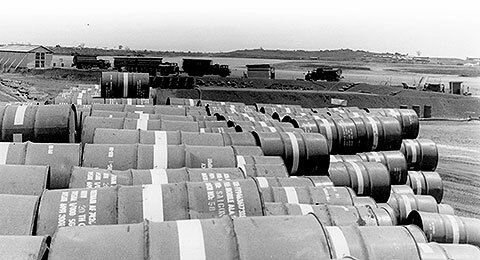 After minimal experimentation in 1961, a variety of chemical agents was shipped to Vietnam via Guam to aid in antiguerilla efforts. The chemicals were to be used to destroy food crops and eliminate foliage that concealed enemy troop movements. On January 13, 1962, three U.S. Air Force C-123s left Tan Son Nhut airfield to begin Operation Hades (later renamed Operation Ranch Hand), the defoliation of portions of South Vietnam’s heavily forested countryside in which Viet Cong guerrillas could easily hide. By September 1962 the spraying program had intensified, despite an early lack of success, as U.S. officials targeted the Ca Mau Peninsula, a scene of heavy communist activity. Ranch Hand aircraft sprayed more than 9,000 acres of mangrove forests there, defoliating about 95 percent of the targeted area. That mission was deemed a success and full approval was given to continue Ranch Hand as the U.S. stepped up its involvement in the war. Over the next nine years, an estimated 20 million gallons of Agent Orange were sprayed throughout South Vietnam. The U.S. military command insisted publicly that the program was militarily successful and had little adverse impact on the economy of the villagers who came into contact with it. Although the herbicides were widely used in the United States, they usually were heavily diluted with water or oil. In Vietnam, military applications were sprayed at the rate of three gallons per acre and contained approximately twelve pounds of 2,4-D and fourteen pounds of 2,4,5-T. 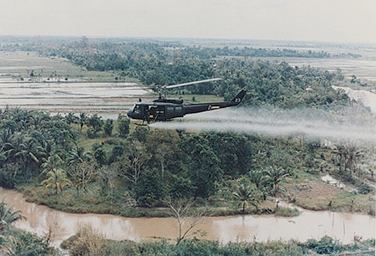 The military sprayed herbicides in Vietnam six to twenty-five times the rate suggested by the manufacturer. In 1962, 15,000 gallons of herbicide were sprayed in Vietnam. The following year that amount nearly quadrupled, as 59,000 gallons of chemicals were poured onto forests and streams. The amounts increased significantly after that: 175,000 gallons in 1964; 621,000 gallons in 1965; and 2.28 million gallons in 1966. Scientists involved in Operation Ranch Hand and documents uncovered in the late 1980s in the National Archives present a troubling picture. There are strong indications that military officials were aware as early as 1967 of the limited effectiveness of chemical defoliation and that they also knew of potential long-term health risks to humans from frequent spraying. 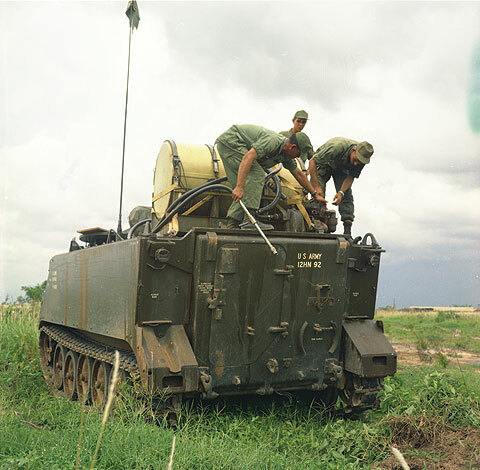 Dr. James Clary, an Air Force scientist in Vietnam, helped write the history of Operation Ranch Hand. Clary says the Air Force knew Agent Orange was far more hazardous to the health of humans than anyone admitted at the time. The issue of “mist drift” continued to plague the defoliation program. How far would it drift? How fast? Wind speed and direction were major concerns in answering these questions. Yet there remained other questions, many of which could not be answered, such as what happened in humid weather. In addition to the planned dumps of herbicides, accidental and intentional dumps of defoliants over populated areas and into the water supplies were not unusual, according to government documents. A memorandum for the record dated October 31, 1967, and signed by Col. W.T. Moseley, chief of MACV’s Chemical Operations Division, reported an emergency dump far from the intended target. On October 29, 1967, an aircraft made an emergency dump of herbicide in Long Khanh Province due to failure of one engine and loss of power in the other. Approximately 1,000 gallons of the herbicide Agent White were dumped from an altitude of 2,500 feet. No mention was made of wind speed or direction, but chemicals dropped from that height had the potential to drift a very long way. The American Association for the Advancement of Science in the summer of 1968 sent a letter to the Secretaries of State and Defense urging a study to determine the ecological effects of herbicide spraying in Vietnam. Secretary of State Dean Rusk suggested releasing “certain non-sensitive” portions of a study on the ecological effects of herbicide spraying in Vietnam done earlier that year by Dr. Fred H. Tschirley. Earlier that year, Tschirley had gone to Vietnam under the auspices of the State Department and returned with exactly the report the U.S. government and the chemical companies wanted. He foresaw no long-term ecological impact on Vietnam as a result of the herbicide spraying, thereby exonerating the chemical companies. “There is no evidence,” Tschirley wrote, “to suggest that the herbicides used in Vietnam will cause toxicity problems for man or animals.” Rusk urged that Tschirley’s report be made public. What Rusk did not mention was that Tschirley’s report had been heavily edited, in essence changing its findings. Some of the troops in Vietnam used empty Agent Orange drums for barbecue pits. Others stored watermelons and potatoes in them. Still others rigged the residue-laden drums for showers. The spraying continued unabated in 1968, even though, according to military records, it apparently was having minimal effects on the enemy. A series of memoranda uncovered in the National Archives (now declassified) indicate that defoliation killed a lot of plants but had little real effect on military operations. As those of us who served in Vietnam attempted to settle back into civilian life following our tours, some of us began to develop unusual health problems. There were skin and liver diseases and what seemed to be an abnormal number of cancers to soft tissue organs such as the lungs and stomach. There also seemed to be an unusually high number of birth defects among our children. Other veterans experienced wild mood swings, while others developed a painful skin rash known as chloracne. Many of these veterans were found to have high levels of dioxin in their blood, but scientists and the U.S. government insisted there was no link between their illnesses and exposure to Agent Orange. 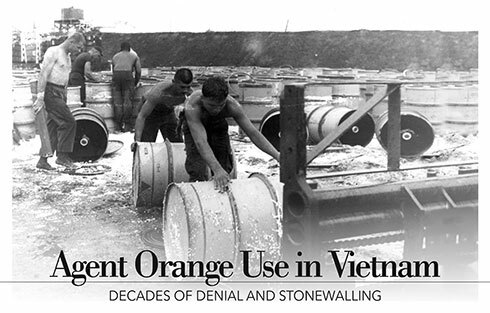 By 1983 the results of studies of Agent Orange and dioxin exposure began to trickle in. They were, for the most part, contradictory and confusing. A series of studies conducted between 1974 and 1983 by Dr. Lennart Hardell—the so-called Swedish studies—showed a link between exposure to Agent Orange and soft tissue sarcomas and non-Hodgkin’s lymphoma. In July 1983 the U.S. Department of Health and Human Services released a report citing “an association” between dioxin exposure and incidence of soft tissue sarcoma. Results of uncorrelated Agent Orange tests continued with widely varying results, depending on who was doing the testing. In December 1985 the Air Force released the third of its Operation Ranch Hand studies. It confirmed the other two: There was no evidence that Agent Orange had any adverse effects on those who handled it during the war. “At this time, there is no evidence of increased mortality as a result of herbicide exposure among individuals who performed the Ranch Hand spray operation in Southeast Asia,” the Air Force concluded. After seven years of study, the CDC had made no progress on one of the most important and highly publicized issues of the war in Vietnam. In charge of the CDC study was Dr. Vernon Houk, director of the agency’s Center for Environmental Health and Injury Control. The White House’s Agent Orange Working Group was supposed to supervise the CDC study while the Pentagon’s Environmental Support Group was charged with providing the CDC with records of Agent Orange spraying and troop deployment. Houk’s CDC team complained throughout the study that those records were too spotty to make a scientific study of the effects of Agent Orange on troops. Not so, said the Pentagon. Richard Christian, the head of the Pentagon’s Environmental Support Group, testified before Congress in mid-1986 that the records of troop movements and spraying were more than adequate for a scientific study. Christian’s testimony was bolstered by two other sources. Retired Army Maj. Gen. John Murray had been asked by Defense Secretary Casper Weinberger in early 1986 to undertake a study to determine if Pentagon records were adequate for purposes of the study. After four months, Murray determined that the records for a comprehensive study of herbicides were more than adequate. But again there was more information available that was never presented. The Institute of Medicine in the weeks before the CDC released its results of blood tests wrote a stinging rebuke of the CDC’s tests methods. It said that none of the CDC’s conclusions was supported by scientific data. The CDC refused to turn this report over to the White House. “Either it was a politically rigged operation or it was a monumentally bungled operation,” said Rep. Ted Weiss (D-N.Y.), chair of the Government Operations Human Resources and Intergovernmental Relations Subcommittee. Other information began turning up that there were concerted efforts by various government agencies to conceal information about the effects of herbicide exposure. Air Force scientists involved in the study said they were pressured by non-scientists within the Air Force and the White House to change the results and delete critical information for the final report. Sen. Tom Daschle (D-S.D.) says he even obtained two versions of the minutes of the meeting in which that pressure was applied. One confirms what the scientists told him. Another deletes that information. “What happened there was a fraud perpetrated by people whose names we still do not know,” Daschle said. In a study released March 29, 1990, the CDC admitted that Vietnam veterans face a higher risk of non-Hodgkin’s lymphoma but denied that it was a result of exposure to Agent Orange. It said the studies showed that Vietnam veterans do not have higher rates of soft tissue sarcomas, Hodgkin’s disease, nasal cancer, nasopharyngeal cancer, or liver cancer. One of the current, pressing issues—among many having to do with our exposure to herbicides—that has received insufficient attention is the matter of the exposure by personnel referred to as the Blue Water Navy: Navy, Coast Guard, and Marine Corps veterans who served off the coast of South Vietnam but within range and often within sight of the coast. Their exposure to herbicides is unique, and veterans’ advocates have engaged in a battle with the federal government for the past ten years, with H. R.299 and S.422 currently in committee with many co-sponsors. But congressional leaders refused to move these two important bills to a vote. Nearly fifty years later, Vietnam veterans are still being stonewalled by our own government. This article is adapted from a presentation VVA life member Paul Sutton made before the first joint US-Vietnam Conference on the use of herbicides in Vietnam in March 2002 in Hanoi. The terms “Agent Orange” and “herbicides” are used interchangeably throughout this narrative.